Ethiopia was country number eighteen and immediately more incomprehensible than the rest right from the start. In Ethiopia the year is 2003 not 2010, they run on their own calendar. In Ethiopia nine o’clock is not 9 am but nine hours after the sun rises. In Ethiopia there are eighty-four indigenous languages, although most speak the ancient language of Amharic with it’s own unintelligible script. 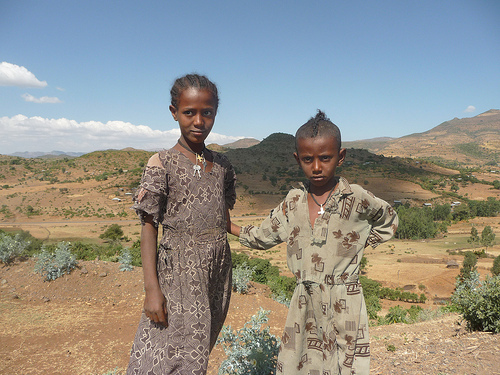 In Ethiopia there are just two medical doctors per 100,000 people. But beyond the bewildering it’s a country full of immense promise for the cyclist. There’s a tasty variety of food, a welcome change after a month of the bean-based foole of Sudan. There is a lower cost of living than perhaps any country I will visit over my five years on the road. Ethiopia also boasts great beers, prodigious mountains, palpitation inducing coffee and rumour had it, the most beautiful girls in all of Africa. I woke early on my first morning in Ethiopia, smothered in a wonky mosquito net and instantly aware of the deafening medley of animal sounds. 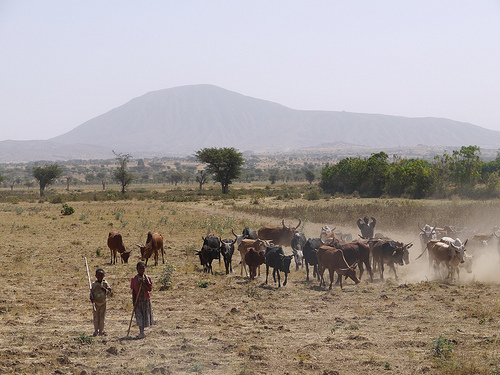 Ethiopia is a land brimming with both people and livestock and it played a very different theme tune to the hushed stillness of Sudan. It was as if each creature was competing with the next. It was ‘Old MacDonald Has A Farm’ at 300 beats per minute, without the lyrics but with guest vocals from an array of anonymous beasts. 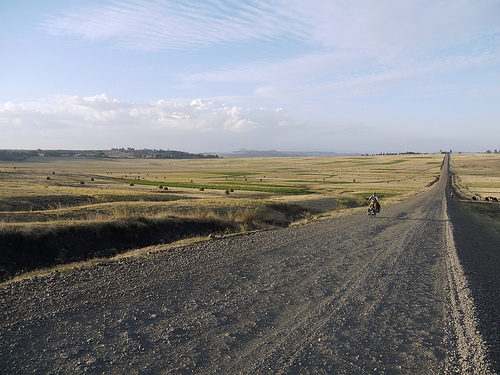 We packed up and cycled east towards Gondar but on the way I continued to struggle with stomach pains and diarrheoa, farting profusely into my slip stream. From behind rang loud profanities as Nyomi cussed with colour and gusto. After two and a half thousand kilometres with barely an incline to test our quads we spied our first mountains. It felt as though we were at sea and a vicious storm was brewing. The hills rolled in like great waves, each one more foreboding than the last. I had my mountain legs, and the vivid memories of obtaining them, but Nyomi had yet to earn hers and Ethiopia offers a unique test to the uninitiated. We edged slowly toward a tough ascent into the Ethiopian highlands, a continuous climb of seventeen kilometres and over one thousand vertical metres. We arrived at a small settlement which marked the beginning of the pass up into the mountains and stocked up on local food and water before I issued Nyomi with a scandalously patronizing pep talk about mountains being bigger in your head than in reality. 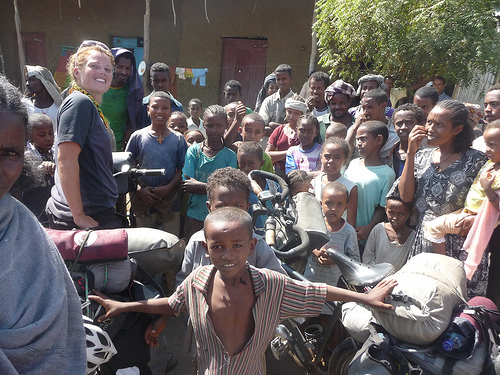 As with every Ethiopian village we came to we were quickly surrounded by a hoard of children and suddenly I realized that bits of our kit were missing from the pocket of my handlebar bag. We tried every tactic to earn the return of our possessions, demanding, pleading and offering money without success. “The thief runs very fast” was the message from onlookers. We gave up and started up the steep side of the mountain. I was angry, at us for leaving the items on show but mostly at the thief in the crowd. I began to hear cries and shrieks from behind. When I turned to look I could see that Nyomi was being chased by another great seething mob of kids. But I noticed that she was sporting a broad grin and it was then I started to understand. They were pushing her up the hill. The idea caught on and soon I had my own group, tiny hands pressing against my racks and panniers and propelling me upwards. It went on for several kilometers and soon we were high enough to get staggering view of the village in the valley far below. They giggled and cheered as they pushed with impressive stamina. At six years old there’s no way I could have run for several kilometres up a steep mountain pushing a fat man uphill on a bicycle. I started to see how the best distance runners in world hail from these parts. The children’s gift could not have come at a better time. Soon the theft was a distant memory. What Ethiopia takes, it also gives back. This, I’m sure, will end up being one of my most enduring and heartwarming memories of Africa and worth more than couple of bits of kit. I realize of course that the image of a group of small, poor, exhausted, black African children pushing a white Englishman uphill on a bicycle is a disconcerting one. Some would say that it even has colonial undertones. You’ll just have to trust me, it wasn’t like that at all. After the children gradually peeled off we powered on unaided, thighs like pistons, doing battle with the mountain and waging war on gravity. I could see the determination and resolve in Nyomi’s face and I knew that this mountain, or any other, would not beat her. Towards the upper reaches a slow chugging truck crept past me and a man sitting on top flashed me a grin and then clenched and unclenched his fist. I instantly understood his message, he was inviting me to latch on. I had heard of cyclists in Africa grabbing onto the back of slow moving trucks to get up hills and I’d always wanted to try. Cheating? Maybe. But my arse was still firmly on the saddle and I’m in this for the experience. I raced after the truck and grabbed a wire jutting out of the back. It took a few moments to steady my weighty bike, then I relaxed my arm and I was coasting upwards. I abandoned my free ride after a passenger leaned out of the window and told me to let go. The irony wasn’t lost on me. The hefty Englishman who had just been pushed uphill by small children was being told to let go of the 15 tonne lorry as evidently he was slowing it down too much. The very young children who shepherd the livestock in Ethiopia were so fascinated by us that they would often forget their role and instead turn and gorp as we rode by. Their animals, now without direction or guidance, would shamble into the road in front of us and there were frequent near misses. I wondered how much a donkey would cost to replace, it seemed that bowling into one face first and at high velocity was inevitable. And if it was an ox, I knew who’d be coming off worse. But it is the goats that inhabit western Ethiopia who are the hardest to avoid. In this part of the world they seem to have lost any inherent will to live. With an air of departing resignation they wait until the last moment as I zoom down a hill and then, in a manner I assume they share with the depressed man who steps in front of a train, they step directly into my path. They make eye contact with me and await their fate whilst I screech to a halt with just milimetres to spare. Perhaps the survival instinct in the goats of Western Ethiopia has been bred out of them intentionally. After all it would be quite useful for a community who slaughter thousands of goats if the goats didn’t really want to live in the first place. On top of dodging all the animals, life became even more difficult after discovering that the rumours were true, the women in Ethiopia are indeed stunningly beautiful. They often took my eye, and on the downhill this occasionally led to near fatal losses of concentration. We arrived into Gondar in the north of the country and roamed the streets, taking in the sights and smells of the new city. We were invited into one family’s home, a grubby dingy shack where ten or twelve slept together. They were all drunk on ‘tela’, a homebrewed wheat beer, including the six, seven and eight year olds. Before we left a friendly local Rastafarian finished off Nyomi’s rudimentary dreadlocks and we had our first taste of Khat, a local plant with a strong unpleasant bitter taste that gives you a hit somewhere between strong coffee and amphetamines. Confident that I have put myself through worse in the pursuit of pleasure, we munched as much as we could tolerate and went out dancing all night. Continuing south we decided on a 270 km unpaved road which would shave off perhaps 100 km from our route, it was a mistake with welcome consequences. The cycling was a grueling slog by any standards. I’d forgotten how hard rough roads can be, on us and on the bikes. But it was the same old trade, the more off the beaten track you are prepared to venture the greater the reward. People in this rural region were more surprised and more welcoming than usual. On one evening as the light faded and we still hadn’t found somewhere to camp, a local farmer and his family invited us in to sleep. We all shared food and he pulled out an animal hide for me to sleep on. During the night I sensed small creatures crawling over my skin, I brushed them aside, intent on rest. In the morning I could see the critters with clarity. The fleas were everywhere. Over the next two days red, intensely itchy lesions covered my back, stomach, shoulders, neck, legs and arms. Nyomi stayed free of bites, but on the same day she managed to lose her glasses and come down with a nasty bilateral conjunctivitis. She had to ride without lenses or glasses, and during our lunch break she squinted and pointed to our left ‘ohhhh, look at that school and all the children’, she was gesturing towards a small group of three donkeys and a goat. The attention we receive in Ethiopia is unparalleled; it ranges from curious and friendly to overwhelming hysteria. Everywhere we are observed with intense scrutiny by dozens of faces. Even going to the toilet in Ethiopia is an unavoidable public spectacle. The faces pop up from long grass, from behind trees, from donkey carts. Faces with bright, unblinking eyes everywhere we turn. We wild camped a few times but each night was a restless one, we talked in hushed tones, terrified of triggering the ‘faranji’ alarm. If discovered, word would quickly spread and the village would all come out to have a look, and in all likelihood, to watch us sleep. Unfortunately the theft in the lowlands was not to be the last. Every so often a youngster would try their luck and bread, jumpers and others bits vanished from our bikes. Lets be honest, it’s hard to stay angry at a small Ethiopian child who steals bread from your bicycle, but we soon learnt that anything not firmly stashed away in a pannier was fair game and in Ethiopia, homeland of the infamous Haile Gebre Sellassie and other giants of distance running, the thief always runs faster than you do. Ahhhh the ‘You’ game. Child shouts ‘you’ repeatedly until you look at them. Child wins. Don’t look and you risk a volley of stones. As you can see it’s a bit boring and there’s only ever one winner. And it’s never you. We never give money to children, for all the obvious reasons. To this our choice response was ‘Absouja’ (‘Ethiopian’ in Amharic) which you can also shout whilst pointing back if you like. There are lots of better things to give – time, knowledge, help with English or just a little entertainment – silly dances routines and animal impressions do best. Don’t be fooled, this isn’t really a question. Very few listen to your answer, but even if they do they will often repeat the same line at a higher volume. I rotated my answers through ‘Timbuktoo’, ‘Basingstoke’; ‘The moon’, ‘anywhere’ and ‘nowhere’ but this got boring fairly fast. Why do the children think we’re Chinese? The Chinese are building roads throughout Africa in return for cheap petroleum. The Chinese are the only foreign visitors some children ever see and so to them, it’s logical that we must also be from China. The ratio of adults to children is very obviously skewed in Ethiopia. It’s not uncommon for families to have fifteen or sixteen children. The average life expectancy is just 45 years so children are everywhere with relatively few adults to exert authority. When huge numbers of children chase us chanting ‘YOU YOU YOU’, brandishing large sticks and throwing stones it can feel a bit like you’ve stumbled into an African ‘Lord Of The Flies’. Add to this that the school uniform is usually coloured overalls making the children look like escaped convicts and Ethiopia can be a daunting place to venture. On the downhill in Ethiopia I’d learnt that the animals don’t move out of the way for a cyclist, whereas the people usually do. So from now on when I see that line of silhouettes I steady my handlebars, narrow my field of vision, build up some velocity and take aim for the smallest people-shaped shadows I can find. We pushed south and neared Addis Abeba, cycling to over three thousand metres above sea level and through vast golden arable plains, coniferous forest and then areas of short grazed green grass with solitary exotic looking trees dotted over the landscape, we could have been riding though the grounds of a stately home or a golf course rather than rural Africa. Lorries passed by with a singular lively but soon-to-be-dead goat tethered to the top. The Ethiopian version of a pack lunch. 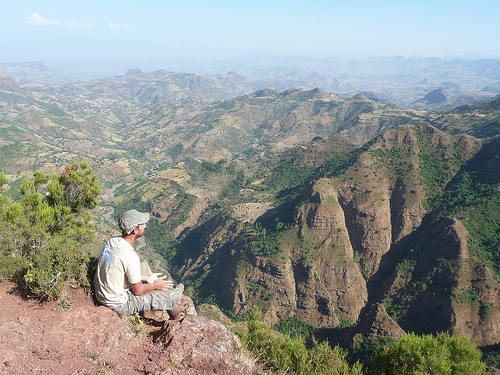 We tackled the infamous Blue Nile Gorge, an even bigger ascent than the climb into the highlands two weeks before. It was particularly testing for Nyomi who frequently had to capitulate and join in with my double handed high fives and accompanying ‘huhhh!’ in an American football style which I frequently insisted on. 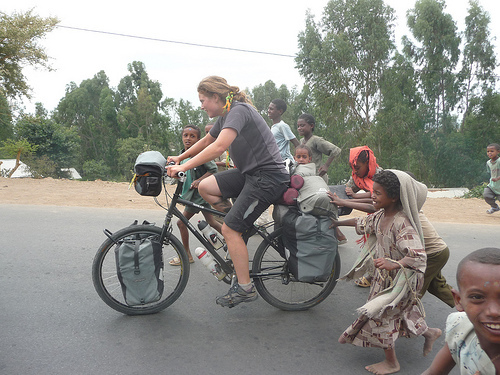 On Christmas day we sang Christmas carols loudly and out of tune as we cycled into the Ethiopian capital. We wished people Merry Christmas in Amharic only to hear ‘Yes. Now bring me my money.’ I gorged myself with food and alcohol, safe in the knowledge that I needed the calories. My weight has dropped to just 65 kg, I have lost 15 kg since Istanbul. Christmas is a reminder of the old and familiar and it did have me pining for home a little. I tried my best to bury a futile yearning for country pubs, chip butties and chocolate hobnobs. Ethiopia wears a dreamlike air of the exotic. My preconceived mental image of African huts and villagers is set firmly in the grassy savannah, not amidst the mountains, and perhaps it’s this juxtaposition that contributes to this aura. Perhaps it’s also the brightly coloured exotic birds dipping and diving over herds of livestock in the fields or the young children with Mohicans and other strange haircuts who chase our bikes and shriek with excitement. Perhaps it’s the rich soundscape in the early evening, shepherds whistling, people yelling, strange birds twittering and whips on the hides of oxen. Perhaps it’s the palpable optimism of the Ethiopian people, they’ve never had it so good after coming through years of oppression, the cruel communist ‘red terror’ regime and devastating famine. But I think that above all it’s that Ethiopia is full of something that makes travelling there completely exhilarating – the unexpected. 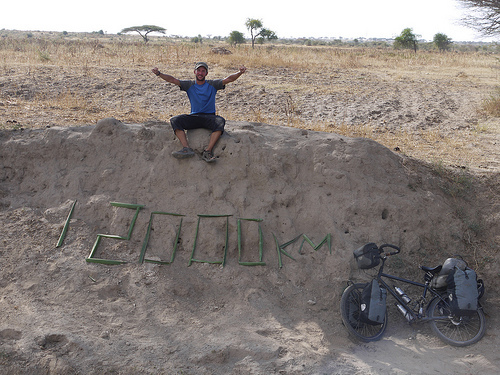 That’s why, of the eighteen countries I have passed through on my bicycle so far, Ethiopia, with it’s extraordinary atmosphere and unexpected sights and dramas around every corner, is my favourite of all. If anyone feels inclined to make a Christmas donation to my charity Merlin please visit my justgiving page http//:www.justgiving.com/cyclingthe6. The adventure continues next through the lawless tribal borderlands of Ethiopia and Kenya, skirting the shores of Lake Turkana, a desolate wilderness where lions, crocodiles and carpet vipers roam. Amazing piece! What an adventure. Its been nearly a year that i met you in Istanbul. Great to know that you are still on the road jumping from adventure to adventure, country to country. I wish i was a little bit older, finished university, and would be a able to start my own journey. Well, the countdown is two years, and i can certainly say that before you finish yours, i will be at my own! Even if i have to do it completely without money. 🙂 I definitely need a lot of advice on how to prepare a journey like yours. I d like to ask you a question. While you were in Syria, have you stayed in the monastery called der Marmoussa? Well, i checked the guest book if you had left some tracks, but couldnt see any. There were a lot of cyclists. I ve stayed there 2 days in my hitchhiking trip to Syria, the best memories of the trip. Wish you all the best on the road! Pumpkin, your posts started out great and have only gotten better. I feel the need to lean back and emit a genteel belch–this reading having been the equivalent of a holiday feast. Your perspective is heartening and inspiring, and, mind you, I patently refuse to be heartened or inspired. Keep chugging up them hills, mate. Wow. Another highly entertaining post my friend. Wonderfully written Steve. Makes me desperately want to visit! Steve you are a talented writer, really enjoy the images you convey. I laugh as I read about the things that come out of kids' mouths – I've gotten a lot of the same biking through southeast asia. Plenty of travel blogs out there, yours is one that stands apart imho. Continued luck and blessings.